Italian-language indie games site IndieVault.it just posted an interview with me! They asked a bunch of interesting questions, including one about my next game. In case you (like me) don’t read Italian, I’ve included the original English questions and answers below. A warning, though: this is just copied from our correspondence, and hasn’t been edited by them, so any mistakes are mine and it may not match the Italian version perfectly. How to Raise a Dragon Released! My June game is finished. 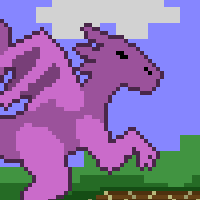 It’s called How to Raise a Dragon, and it’s a game about dragons, humans, and eating things. The dragon: a majestic and complex beast. How is it born? How does it live and die? Magus X. R. Quilliam’s definitive work, How to Raise a Dragon, describes all that is known about these great creatures. Play How to Raise a Dragon on Armor Games.